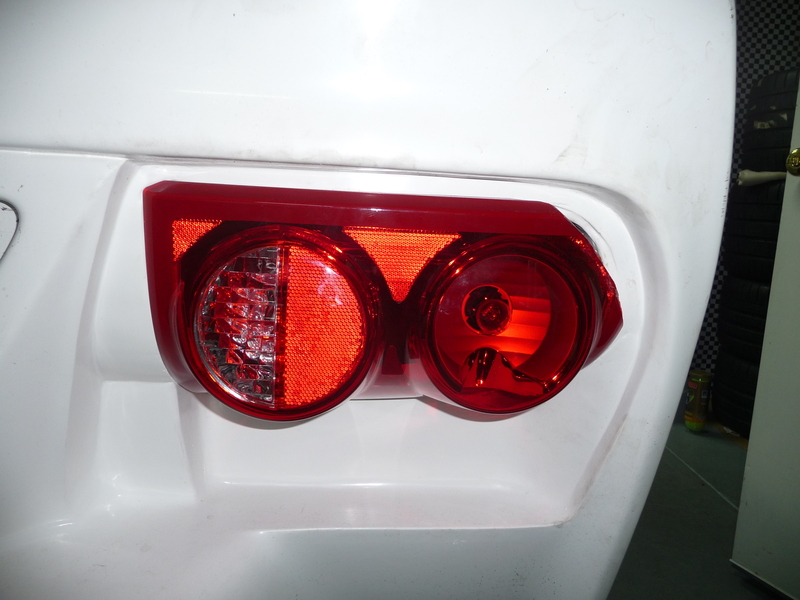 Installing the tail lights at first feels a bit like “square peg in round hole”. Indeed, you do have to trim some stuff to make the light fit in the opening and then you have to figure out how to mount it. I thought about this a lot and looked at various other builders’ solutions. In the end, it’s an amalgamation of those or unique – the same thing in this case. So below is the step-by-step of what I did. Does a Porsche engine fit? Yes it does! But it’s not easy. This question was just asked on the gt40s.com forum, so I thought I’d write a more long-form answer here. My drivetrain is from a 2004 Porsche 911 GT3. It’s a 996 Porsche in Porsche-speak, a naturally aspirated engine which can be traced back to the LeMans-winning GT1 Porsche and beyond. The block is known as the “Mezger” engine and it’s proven so durable that it’s even being deployed in the new 991 GT3 coming out this year. It’s also used on the 996 and 997 Turbo or GT2 (also a turbo) models. For this project, you likely can’t do a turbo engine though, because the exhaust routing will be very hard without major chassis modifications. But I wanted a high-revving naturally aspirated engine anyway. Redline should safely be in the low 9k. Pictured on the left is the front of the car, specifically the radiator as viewed from standing just behind the left front tire. 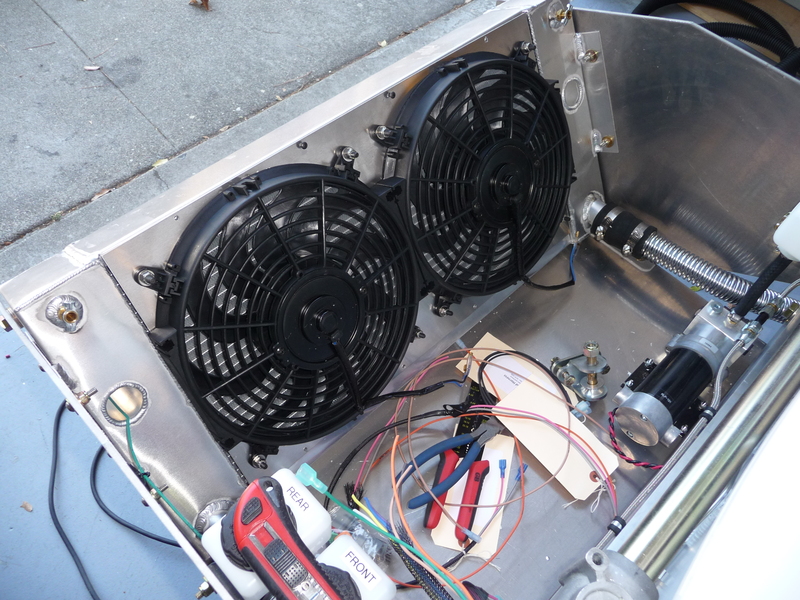 The car comes with this custom radiator essentially installed, but the fans just come on their own without any brackets to mount them. That’s a where a fan shroud comes it. 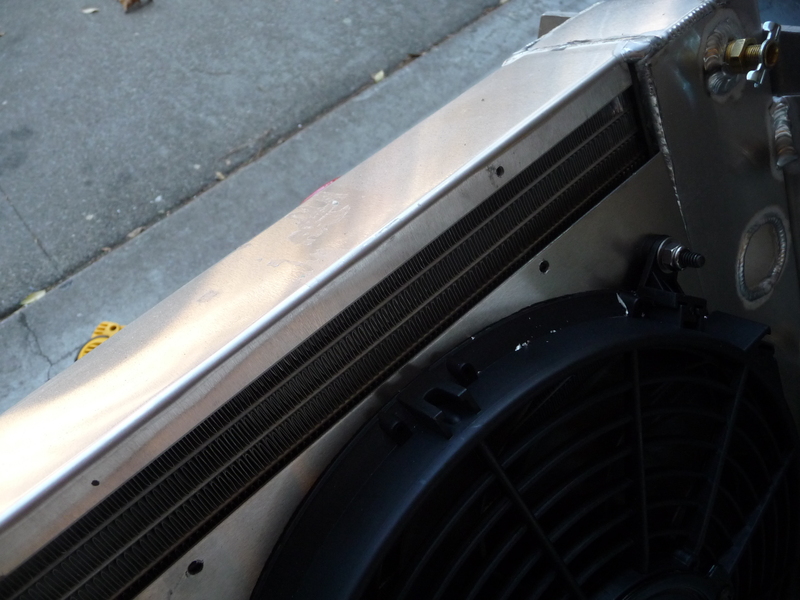 It serves as a mounting point for the fans and it also more or less forces air to go through the fans and not around them. 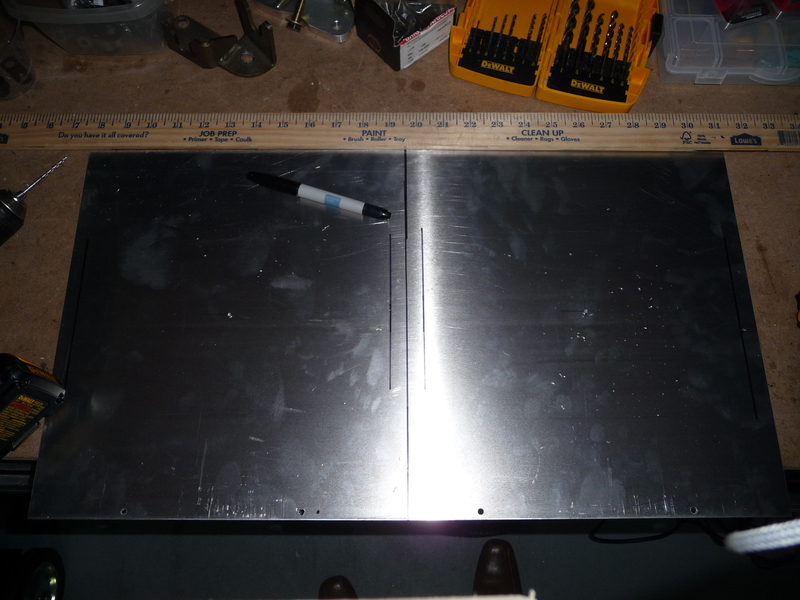 Enter a piece of aluminum, a jigsaw and some very precise measuring. In the end not a very difficult task, but you have to get a lot of measurements exactly right. 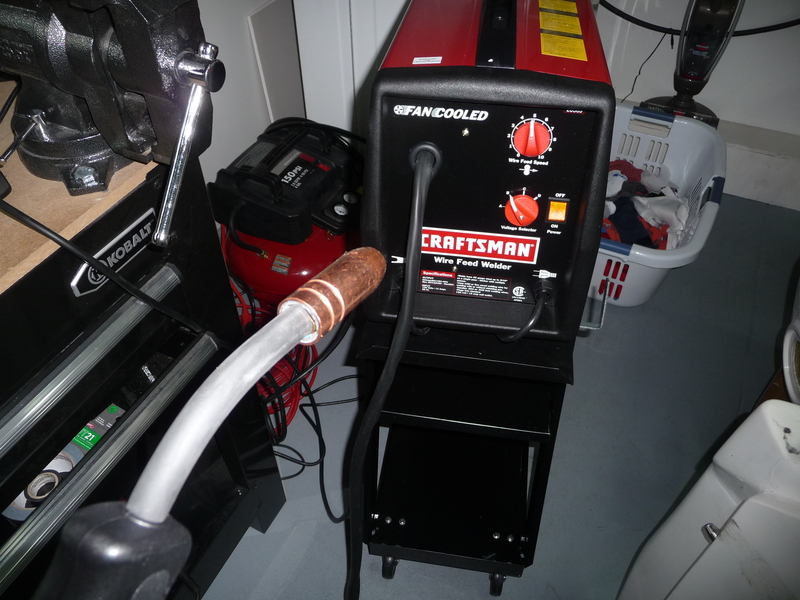 Below are the simple steps after purchasing a piece of aluminum cut to the width of the radiator and high enough so that I could screw it into the top and bottom radiator cross-brace. Step 1: Find the center of rectangle and the center of each fan. 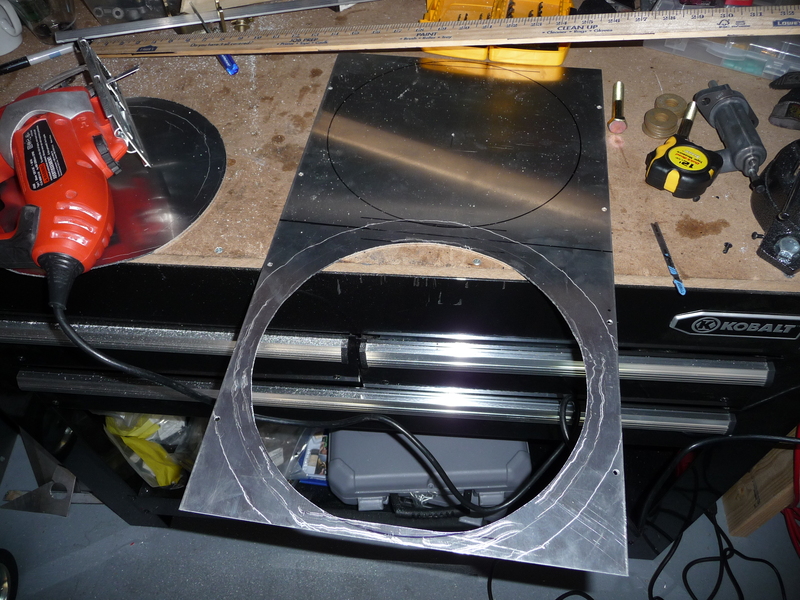 Also note that full circles on each fan would make the outside strip between the fans and the outer edges quite narrow, so I kept that a little straighter. Step 2: Ghetto compass for drawing circles. 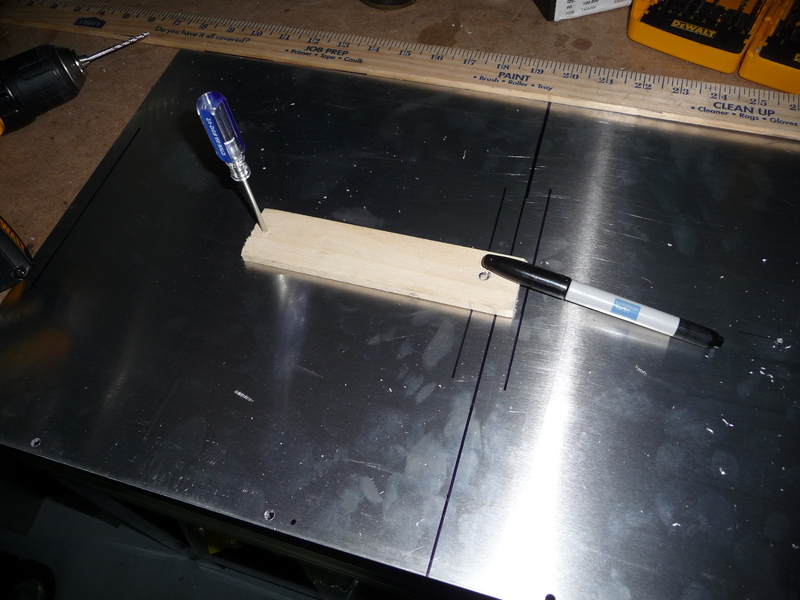 I held the center in place with a screwdriver and had a hole big enough on the other end to fit a marker pen. Step 3: Start cutting. I just used a jigsaw. Does the trip you can hide the slight scarring on the inside if you really care. (I did). Note the wider straight strip on the outside. 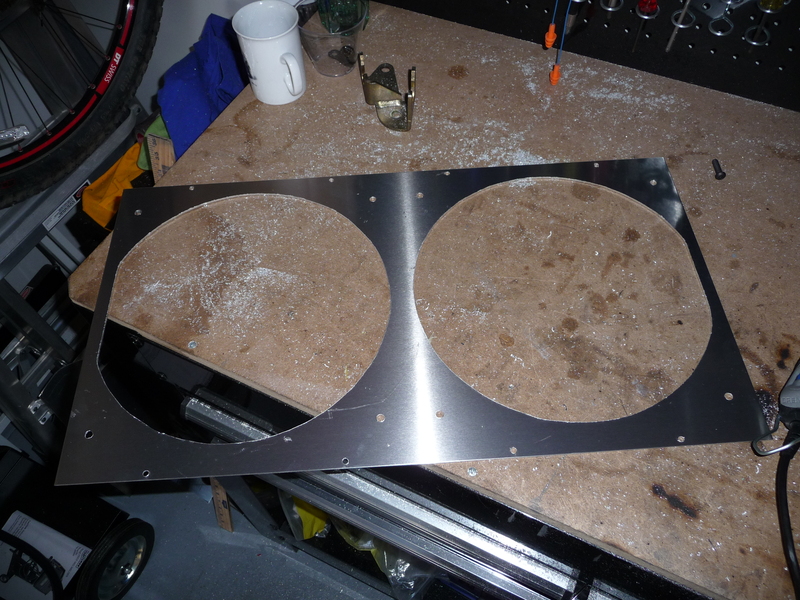 Step 4: Finish product, holes drilled to mount the fans from the inside. 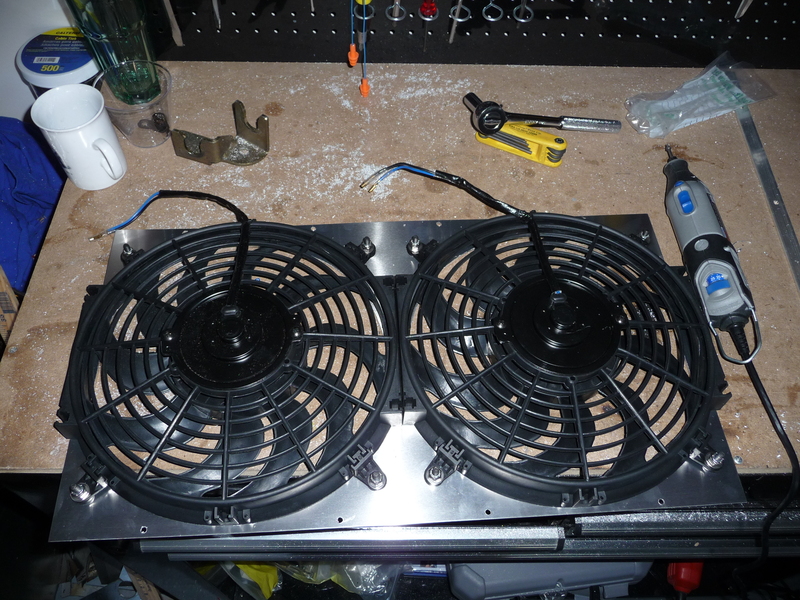 Step 5: Mount the fans. I used stainless 1/4″ allen key button head screws with lock nuts. Step 6: Drill the radiator. Aaaaah! Actually, it’s not that bad. There’s nothing but air behind that cross-brace. I had previously put mounting holes in the shroud, so I just aligned using those and then drill-tapped allen key button head screws in. And the finished product… excuse the wiring mess. That’s since been cleaned up obviously. Emergency brake (e-brake, parking brake) systems in most cars are a purely mechanical system using a cable. In the passenger compartment the hand brake lever pulls two wires which have a direct cable link to a caliper on each of the rear wheels. The brake clicks because it ratchets and you press the button to release. 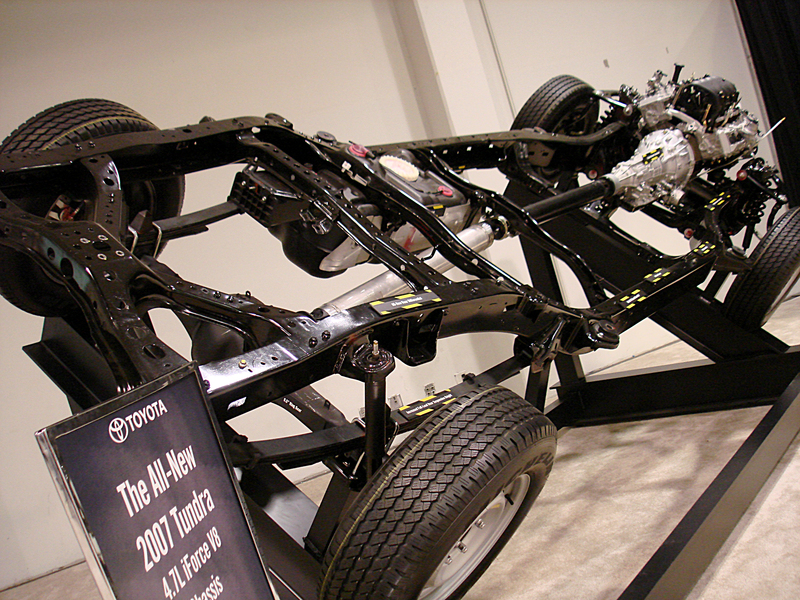 Some cars have a foot-operated brake that are the same concept. Anyway, cable-driven e-brake it is. Reliable, proven, easy to adjust and maintain. But not that easy to install in my case. Here’s what I had to do to mount the caliper – cables have not arrived yet, so I’m holding off on the handle install until then.